Godless, perverted, secular, humanistic, atheistic forces have swept America. The Supreme Court just struck down the Defense of Marriage Act and ruled it unconstitutional. I am not judging the homosexual. The Bible does all of the judging. If you want to know what God thinks about homosexual perversion look at his urban renewal development plan for Sodom and Gomorrah and it’ll give you a pretty good idea. Sodom and Gomorrah is God’s pilot study for his response to the homosexual society. The fact is that not everyone in Sodom and Gomorrah was homosexual. Abraham had asked God if he would save the cities if ten righteous people opposed homosexuality. They were not found. So here is the measuring rod: It’s not if the government approves it, it’s if the people accept it. And if the righteous accept it judgment will come to America. America must return to God! Our secular colleges and universities have liberal professors who begin their class by telling students that they are foolish if they believe in God or the Bible. These soft minds soak this up. The church sat back and did nothing and said nothing. As a result we now have a nation that doesn’t believe in the reality of God’s Word or the sovereignty of God. When God gets through shaking our nation I believe everyone will acknowledge the sovereignty of God. These godless, secular forces are attempting to batter down the very foundations that have made America great. Because of the godless influence through liberal universities, colleges, textbooks and even in many of America’s pulpits, we are faced with a grave and very serious question: Which way is America going to go? I am appalled at the godless, secular, humanistic tide here in America, in the pulpit and in the pew, and in the liberal colleges and universities. We know that this godlessness has been eroding at the foundation of our nation for many years. The only thing that can save America now is for the American people to return to God! We stand at the crossroads. Which way America? We must choose God! We must denounce the forces of sin, secularism, humanism and atheism that are seeking to destroy the soul of America. We who are Christians must stand firm and true and sound the trumpet for God. As Christians it is not our job to prove there is a God. We know that God has proven himself. The change that takes place in a person’s life when they give their life to Jesus Christ is proof that the Holy Spirit is able to transform a sinful heart into a saint of God. We are to proclaim the Gospel for it is the power, the dynamite that can blast out the sins of humanism and secularism that are paralyzing the power in the pulpits and the pews across America. The Gospel is the power but we must put the ‘Go’ in the ‘Gospel’. The Gospel is the Good News that a Savior for sinners was born; that He died on the cross for our sins; that He arose again the third day; and that He ascended into Heaven; that He can save every sinner that will surrender to Him! This is the Gospel of power that needs to be preached that can change people’s lives in America. Before their conversions James and John were known as the ‘Sons of Thunder’. The Gospel stirred their hearts and changed these two men, one into an apostle of love, the other into a Christian martyr. The Gospel converted a man who was called the ‘Big Fisherman,’ Simon Peter, who could hardly open his mouth without a curse word flying. But God changed his heart and filled him with the Holy Ghost. As a result, Simon Peter became a ‘Big Fisherman for Souls.’ On the day of Pentecost He preached a message that was so powerfully anointed by the Holy Ghost that 3000 people, cut to their hearts, cried out and said, “Men and brethren what shall we do?” Peter said,’ “Repent and be baptized every one of you in the name of Jesus Christ for the remission of sins, and you will receive the gift of the Holy Ghost.” Then in Acts 2:41 it says that 3000 people were saved, baptized in water and added to the church! What a massive harvest of souls! The power of the Gospel burned the heart of Saul of Tarsus. He was persecuting the church and having Christians stoned, thrown into prison and killed. But on the road to Damascus he met the Master and obeyed the Gospel. God changed Saul to Paul, the great preach and missionary who blazed Gospel highways across the western world winning entire communities to God. The power of the Gospel under the anointing of the Holy Ghost did it! The power of the Gospel, the power of the Holy Ghost, has not lost one ounce of its power since that day. What it did in the first century it will do in America in the twenty first century! What it did through Paul it will do through you and me. It will still change lives, homes, communities, America and this world! It is the only hope for America!!! It is the only hope for humanity!!! The Gospel is the hope, the Holy Ghost is the hope, because it is God’s dynamite which is able to change the hearts and lives of people. Many of you know what the Gospel will do because of that it has done for you. You know what you were like before the Holy Spirit drew you to a place of repentance. You were wicked and sinful and you didn’t care how you lived, what you did with your money, how you spent the Lord’s Day and how you talked. But one day you came face to face with the Master and the Holy Spirit drew you to Jesus and He changed your life. It wasn’t a preacher, denomination, or a religious group. It was the power of the Holy Spirit when you placed the steering wheel of your life in God’s hands. Lucky Cash is a young man that was spending $450 a week, approximately $67000 over 5 years, on his addiction to alcohol. God grabbed hold of his heart, saved him and delivered him instantly! He is now the director of ‘Radical Ministries’, effectively ministering to hundreds of people every week! The power of the Gospel under the anointing of the Holy Ghost did it! When I surrendered to Christ I was smoking three packs of cigarettes a day and had a very expensive cocaine habit for several years. The power of the Gospel under the anointing of the Holy Ghost grabbed hold of my heart and I have never been the same since!!! The Gospel that changed you is the Gospel that the whole world needs and is perishing without! What the Gospel did for you and me it will do for others. I’ve had the opportunity to preach the Gospel to millions of people by way of evangelistic crusades, television, radio, internet and revival services witnessing millions finding their way to the foot of the Cross! What has happened in my life has happened because of the power of the Gospel and the power of the Holy Spirit! If God can take me, a drug dealer and addict, and make anything out of me, you know that He can change your life even as He has changed the lives of multiplied millions of others…and He can change America! Psalm 9:17 says, “The wicked shall be turned into hell, and all nations that forget God.” If America continues to turn our back on God we will plunge into spiritual suicide and soon into an everlasting hell. We as Christians know that the only way is God’s way. We must continue to set ‘Revival Fires’ across America and around the world. 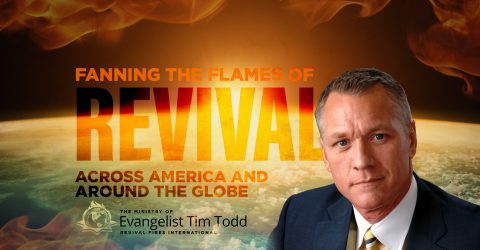 We must burn and blaze a trail with the Gospel of Jesus Christ through radio, television, evangelistic crusades, rallies, revivals and Bible distribution.